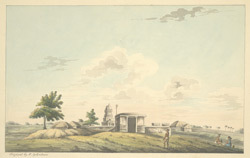 Water-colour painting of the temple at Durasapatam by Benjamin Sydenham, 26 March 1798. Inscribed on the front in ink is: 'Pagoda at Durazapatam, March 26th, 1798. Original by B. Sydenham.' Lieutenant Benjamin Sydenham (1777-1828) served with the Madras engineers from 1794 to 1808. During 1798 he surveyed a route from Hyderabad to Ambur.